Neighbors are encouraged to set up their spiral trees on Saturday, Dec. 8 and participate in caroling on Sunday, Dec. 9. 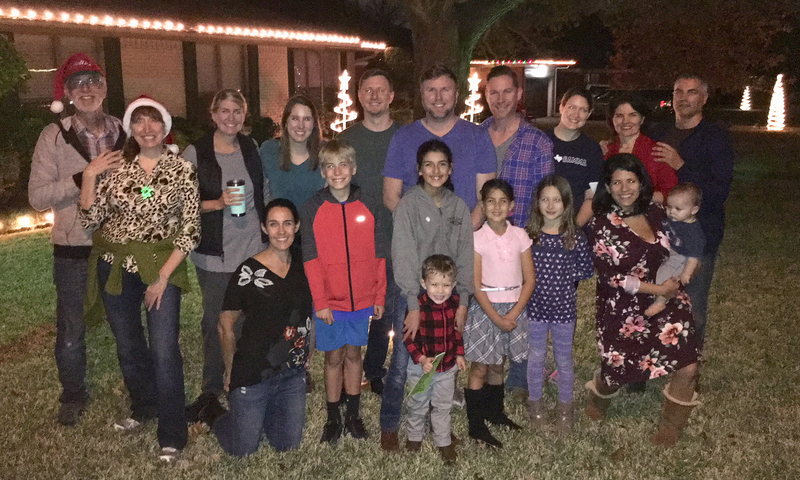 Heights Park Neighborhood Association has two winter traditions that are greeted with a ho, ho, holiday spirit by many. 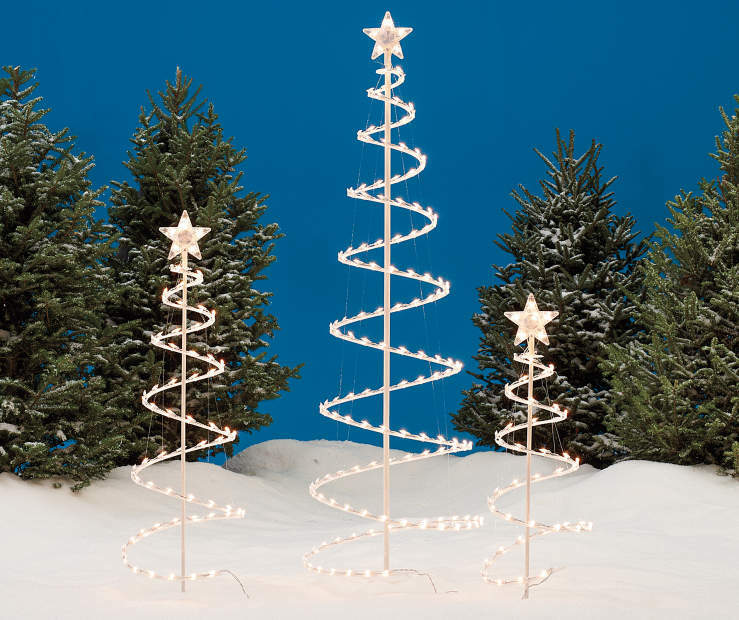 If you need a spiral tree, they are available at stores and online — Walmart, Target, etc. — for about $30. When the leaves have fallen and revealed the beauty of bare branches, we ask residents to light up their streets with white spiral trees. Last year’s plantings were plentiful, but we want to see more! If you don’t yet have yours, seek out a spiral, secure a socket and sprout your spiral on Saturday, Dec. 8. — just in time to provide the perfect setting for the second tradition. On Sunday, Dec. 9, we will once again gather for Holiday Sing and Stroll. We will serenade our friends and families by caroling while strolling through the neighborhood. Just picture yourself strolling and singing among the spirals. In order to plan our caroling routes, we need to know who will participate. Email contact@heightspark.com to let us know you are coming. Songbooks will be provided; additional details are forthcoming. As you know, fall is our favorite time of the year and we love being able to spend cool afternoons outdoors in the garden. 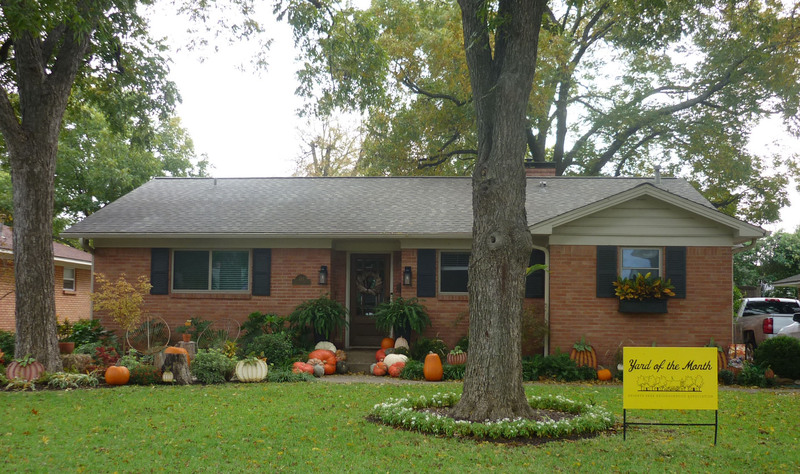 We’re so excited to be this year’s Yard of the Month for November. Our front garden is continuing to develop and is always evolving with new types of plants and different placements, so we are so honored to be recognized by the neighborhood with this accolade. Letty and her dog Sammy are part of the Richardson Dog Walker Watch Program. Editor’s Note: Know Your Neighbor is an occasional feature of the people who make Heights Park such a great place to live. We believe everyone has a story to tell. If you know a neighbor who should be featured, email contact@heightspark.com. 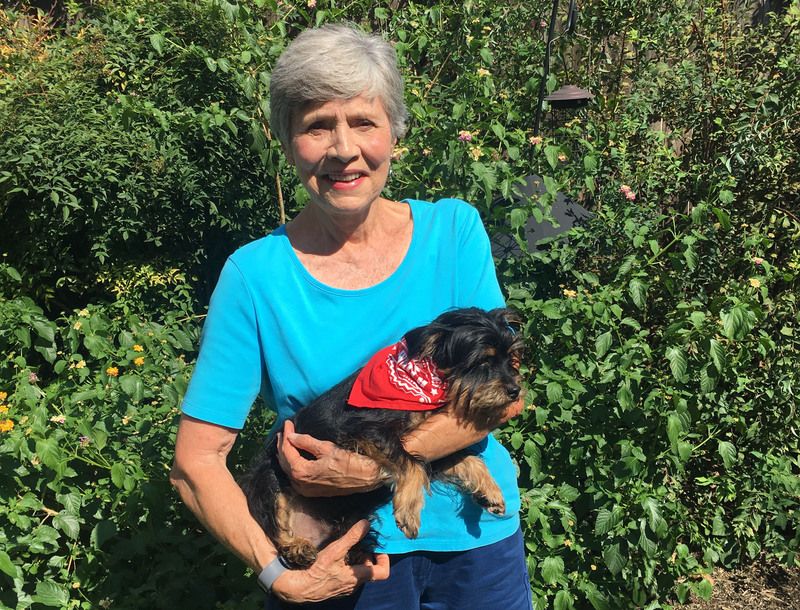 Letty Biedenharn and her dog Sammy walk about six miles almost every day. Letty has been a member of our Neighborhood Crime Watch Patrol and now Sammy is, too! She is also very involved in all things Heights Park — Yard of the Month committee, Book Club, Welcome Committee, and Block Captain. The Dog Walker Watch Program is the perfect partnership for you and your pooch. While you and your pup are out walking, you can provide extra eyes, ear, and tails to help assist your neighbors and Richardson Police Department with ongoing community crime watch efforts. The program trains you how to observe and report suspicious activity. Fill out the online application here. How long have you lived in Heights Park? Great neighbors and that it’s a wonderful, safe place to walk, which I do every day that it’s not raining hard or icy! Also, I am across the parking lot from my church — Episcopal Church of the Epiphany. Tell us something interesting about you and Sammy. I’m a retired Richardson ISD teacher. I love to travel. I spend a good bit of my time involved in my church. I also love kids and have special young friends that I spend time with, including some in the neighborhood. Sammy also has a sister that lives in the neighborhood. What made you decide to join the dog-walker program? I have been a Crime-Watch Patrol person for about eight years. Since I am able to do my patrols as I walk and since Sammy always goes with me, it seemed like a natural thing to make him an official patroler, too! Did you and Sammy receive any training? Dogs participating in the program must be registered with the Richardson Police Department, and there is a training session that is required before a dog receives its official Dog Walker Watch bandanna. However, we received an exemption because I already underwent Crime Watch training. I’m proud to say he was the first official member of the Richardson Dog Walker Watch Program. 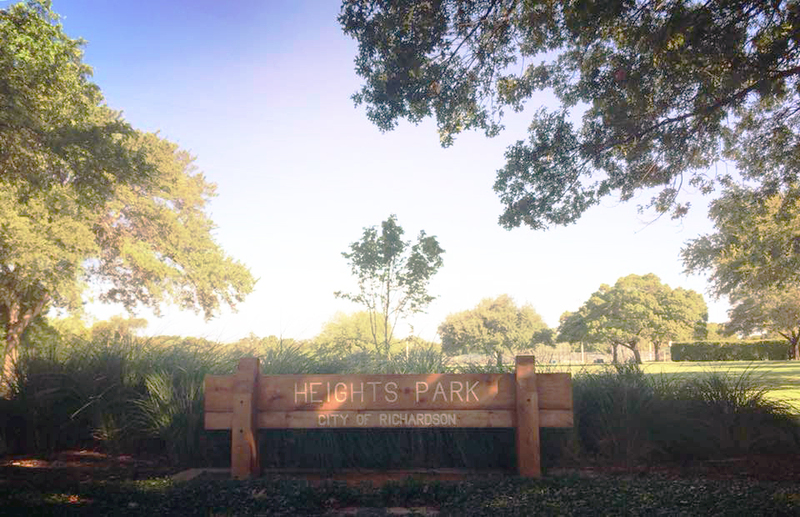 Hear what your neighbors had to say about the favorable community and home we know as Heights Park! We’ve compiled a top 10 list of Heights Park’s best attributes, as told by our appreciative residents. 10 — An active crime patrol for a safer living environment. 9 — Riding bikes to eat breakfast at Communion, Parks Donuts, Cinnaholic, etc. 8 — Richardson High School Homecoming Parade – Go Eagles! 7 — Our local YMCA, Youthfully Mobilizing Community Activities. 6 — Heights Park Neighborhood Association’s (HPNA) neighborhood-wide illuminated spiral trees in winter. 5 — Heights Aquatic Center is liquid heaven for summers that are hotter than &#$*! 4 — HPNA’s annual The Heights of Summer traveling block party is sizzlin’ fun! 3 — Our namesake neighborhood park, where you can play sports, relax and run, and explore its pretty shale-lined creek. 2 — Hanging out in a front yard with neighbors of all ages. 1 — Unique, vintage homes from the ’50s and ’60s and the majestic, mature trees. As indicated by these results, we have an exceptional neighborhood just waiting to be explored. How about using the shade of our most popular answer to enjoy our very own Heights Park neighborhood. If you would like more information on any of the HPNA activities, please email us at contact@heightspark.com. What an honor and surprise to be selected by the Heights Park Neighborhood Association as Yard of the Month. I purchased this home in the 1990s and it has always held a special place in my heart. We have been through several remodels and yard renovations during that time. Life changes, but the charm of these homes, captivating landscapes, and of course the love of our neighbors, are everlasting. We are fortunate to still have four of the original trees, two of which are native pecan. The shade from these wonderful trees is really a blessing during those hot summers. I am very passionate about flowers or bushes with color. Red Texas sage, lantana, cone flowers, purple shamrocks and spider lilies are just a few of my favorite perennials. I love walking the neighborhood and seeing everyone’s take on their favorite decorative and inspirational touches. We have been blessed throughout our time here and look forward to seeing what the future brings. Thanks again for the wonderful recognition. I appreciate not only my Heights Park neighbors, but also the great neighbors throughout our city. New to the neighborhood? 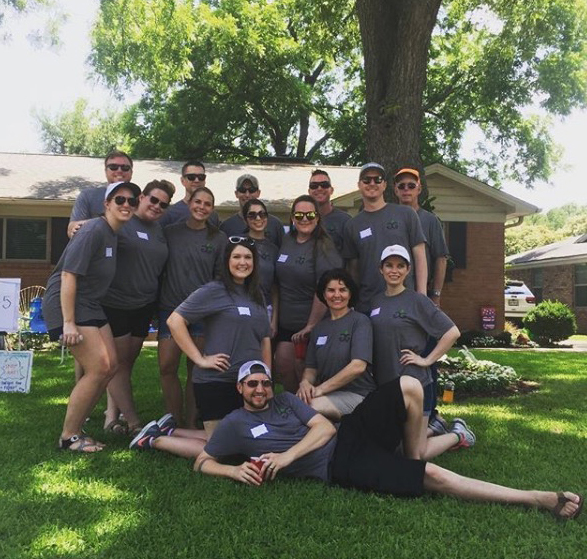 Want to volunteer for neighborhood events? Need service hours? Come check out what your Heights Park Neighborhood Association has to offer! There are no stiff meetings to attend. Just neighbors being neighbors, making our community strong and fruitful. Did you know that our association is now up to 308 members? That’s the most the association has ever had! In one year, our HPNA gained approximately 100 new households! This could not be possible without amazing volunteers and creative ways to reach the community. Have you attended or taken part in any of the following? The Heights of Summer Traveling Street Party. Spiral Tree Yard Light Decorating. If you have … THANK YOU!! You have witnessed the work and dollars of your HPNA dues and wonderful volunteers who put these on. More importantly, that means you are enjoying these HPNA events. If you haven’t or would like to help out with any of these, or would like to see other kinds of events implemented, contact us at contact@heightspark.com and see what HPNA is all about! And if you’re not a member, please consider the nominal fee of just $20 a year to bump up that 308 and ensure all this activity can continue. Join us and join in! 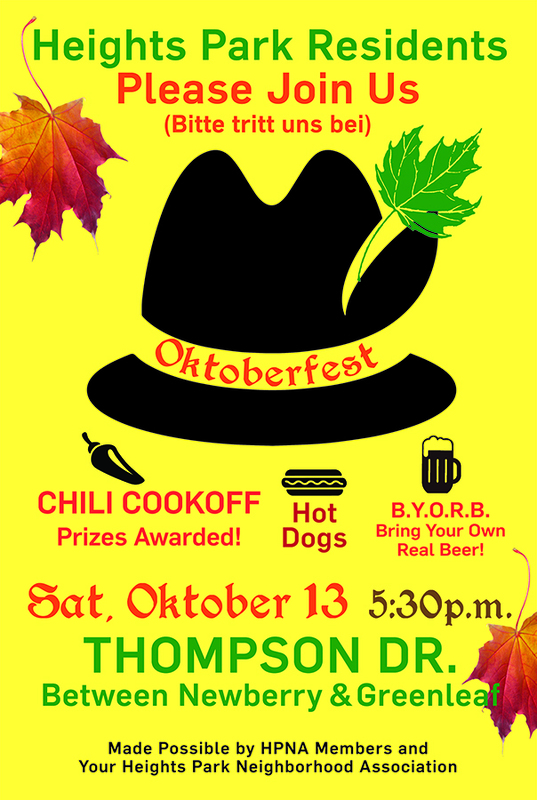 Last year the Heights Park Neighborhood Association revamped Oktoberfest, changed its location and introduced a chili cookoff. Well, it took off hotter than a habanero! So it didn’t take a bean brain to figure out it should be repeated. The year’s festival will once again take place at 5:30 p.m., Saturday, Oct. 13, on Thompson Drive between Newberry and Greenleaf. The pot-ular Chili Cookoff will kick things off and competition is expected to be fiercer than last year. Wanna show off your secret recipe or prove to your neighborhood you’re a better cook than your spouse? Prizes will be awarded for the top three tastiest treats, and the winner will be able to proudly show off with a winner sign posted in his/her yard following the event. You must enter by Wednesday, Oct. 10. Send an email to contact@heightspark.com to enter. Six quarts is the minimum quantity required for entry. If you don’t cook, just come chow and chat. D on’t forget to bring the beer — after all, it is Oktoberfest! HPNA will provide all the fixins, hot dogs, chips and root beer for those teetotalers. A smores station will sweetly round out the menu. So set the date aside, stew away or salivate until the event is here. 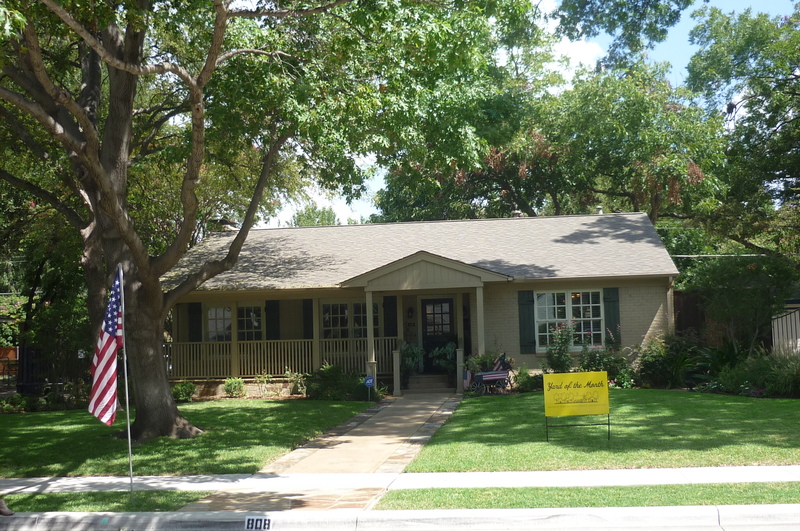 Thank you so much to the people of Heights Park for naming our home Yard of the Month. We bought our home in 2011 and moved in October of 2012. We rehabbed the property inside and out and have really enjoyed both our home and being a part of such a great neighborhood. We looked at this neighborhood for many years before moving. We loved the beautiful lots with all the trees. 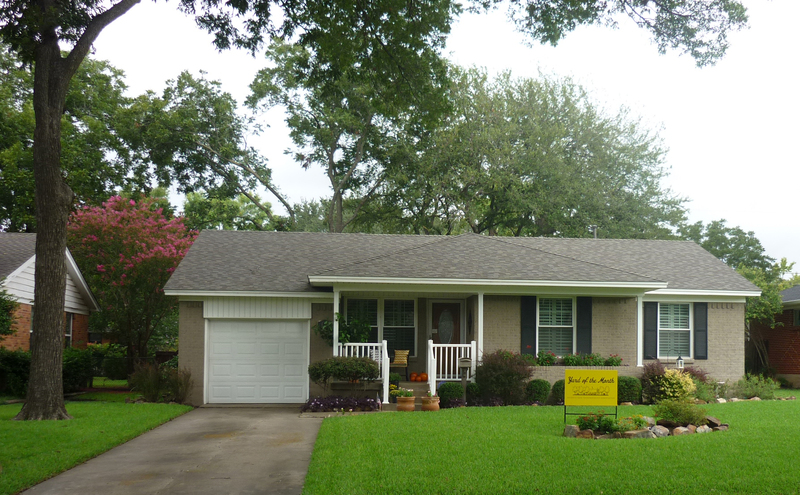 When we redid the yard we wanted both to update it but to keep the old charm that drew us to the neighborhood. We must add that Heights Park is just a special area. We love all our neighbors on Ridgedale. We have lived in various places in the Dallas area as well as a couple stops in Orange County, Ca. and we can say Heights Park is a very special place. Thanks again for the recognition but more importantly thanks to all our neighbors for making Heights Park such a special place to live.